100% brand new large bird cage. Perfect for multiple birds like Cacique, Pionus or others. Ideal for securing large birds while offering adequate free space. Durable iron construction with non-toxic coated texture. Strong and steady metal main frame of quality craftsmanship. Three floors with 2 metal ladders. 2 large front doors, each comes with a bared on-cage window. A removable metal cage bottom with handle . A removable plastic tray for easy cleaning.8 interior plastic feeding bowls secured by bared feeding windows.6 interior wood rest perches. 2 Large front swing-out doors secured by metal locks. Each door with a feeding window.4 ball shaped swivel casters, tough and easy to move around. A bottom metal shelf for added storage. Cravog Flight Cage is a multi-purpose bird cage. Great for smaller birds like Parakeets, Canaries, Finches, Lovebirds and Cockatiels. 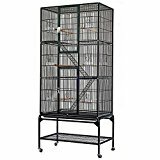 This entry was posted in Small Animals and tagged 69.2'', Aviary, Bird, Cage, Cravog, Flight, Large, Macaw, Parrot, Stand, Wheel, Wire by One Boutique. Bookmark the permalink.